Many of us spend hours upon hours in front of our Macs. Between all the emails, documents, projects, and PDFs, it can be easily to lose track of time. Time Tracker, a utility developed by Aaron VonderHaar, offers a highly customizable yet easy to use solution for anyone looking to track their time spent on the computer. With Time Tracker, you track tasks either individually or as part of larger projects. Once created, tasks may be sorted by the client name, project name, date, total time spent on the project, and a number of other criteria. Time Tracker includes custom filters, too, which allow for an every higher degree of customization. Want to know how many hours you spent working on a project on Mondays and Thursdays in the last six months? Time Tracker can tell you. The app includes a menubar applet for easy access to start and stop tasks. Despite its highly customizable options, Time Tracker does include a few drawbacks. For one, Time Tracker does not display elapsed time spent on a project in its menubar applet, as other apps in this category do. Time Tracker also limits users to inputting data as either tasks or projects; it does not support sub-tasks or itemized task lists, for example. While it lacks the overall polish of its paid counterparts, Time Tracker is a useful utility in its own right. 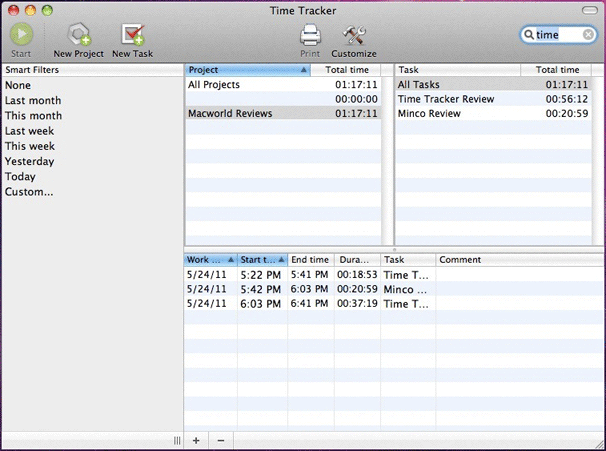 While there are many time tracking applications available for the Mac, few offer the ability to sort tasks as quickly and easily as Time Tracker.